One Direction, Girls Aloud, Ashleigh and Pudsey and Robbie Williams entertained The Queen at the 100th Royal Variety Performance - her 36th - at the Royal Albert Hall last night. 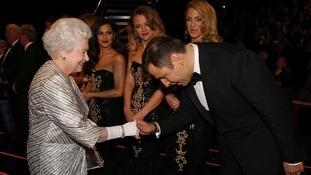 The Queen has been treated to another brush with Bond at a special Royal Variety Performance. After her surprise appearance with Daniel Craig at the Olympics, the 007 theme continued for the 100th anniversary of the charity show, with even the most famous dog in Britain playing his part - as Nina Nannar explains. Clip courtesy of the Royal Variety Performance. One Direction performed their latest single Little Things at the Royal Variety Performance.